Mister Rogers does not change into his sweater but instead keeps his jacket as he prepares to visit Negri's Music Shop to buy a television set of his own. First, he goes to the kitchen where he takes a small amount of money from his pocket. Looking at the differences between the various coins, he explains that more money would be needed to buy the television. After taking out his credit card, Mister Rogers goes on to talk about how buying items on credit is like "a promise to pay" for things. At Negri's Music Shop, Mister Rogers finds a color set at a discounted price and pays with his credit card. Joe Negri will have the set packaged and delivered by Mr. McFeely. Returning to his house, Mister Rogers changes into his sweater and sneakers and suggests that Joe Negri trusts that he will make the promised monthly payments on the television purchase. In the Neighborhood of Make-Believe, everyone is invited to the castle to watch King Friday's new television set. When Lady Aberlin turns on the television, she is reprimaded by the King as it was his intention to turn on the television himself. King Friday turns the set off and back on, ultimately turning past shows which appeal to his guests and in to a program of his liking. Several guests at the castle find the King's program dull and decide to leave. The King declares that all people of Make-Believe must come to the castle tomorrow to watch the show on his television. Back at the house, Mister Rogers talks about people who try to make you learn something you are not ready to learn. Mr. McFeely arrives to deliver Mister Rogers' new television. After explaining the concept of warranties, Mister Rogers tunes his television to a live feed of himself and shows how he still exists once the television is turned off. 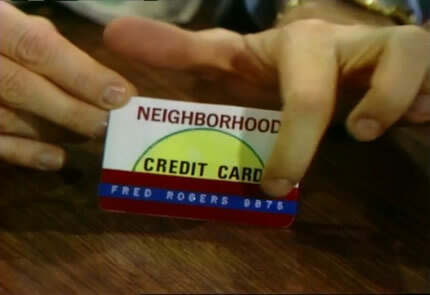 Mister Rogers uses a "Neighborhood credit card" with the number 9875. Among the multiple conversations in this episode involving payment and money, dollars and cents are never mentioned. Mister Rogers sticks with his usual arbitrary amounts spoken in numbers. For example, Joe Negri mentions that the television set purchased by Mister Rogers usually sells for "345" but it is on special for "295." Let's Be Together Today plays in the background as the episode transitions to Negri's Music Shop. As it transitions back to the house, Just For Once plays. When X the Owl opens his door, Lady Aberlin has to quickly duck out of the way to avoid being struck by the door. Before ultimately settling on a television program about finances and the stock market, King Friday turns past a show about nursing (which appeals to Dr. Bill), one about cat hats (which appeals to Henrietta), one about Benjamin Franklin (which appeals to X the Owl), and one about cooking (which appeals to Queen Sara and Elsie Jean). The boring program everyone watches on the television at the castle appears again in Episode 1237 when King Friday rudley changes the channel on the television set. When X the Owl and Henrietta Pussycat arrive at the castle, X announces, "Here I am, everybody! And my feline friend is right beside me" -- only Fred Rogers errantly uses King Friday's voice to deliver the second half of that line.